Have you ever received an apology that didn’t quite cut it? That made things even worse? Plus, let’s face it – life can be messy. Despite your best intentions, it is nearly impossible to avoid causing harm or hurt every so often. So – when is an apology necessary? How do you apologize effectively? Isn’t “I’m sorry” enough? 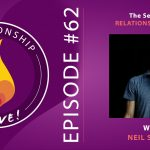 What are the key ingredients to be able to repair a relationship in a way that makes your connection stronger? And what is the place of forgiveness in all of this? 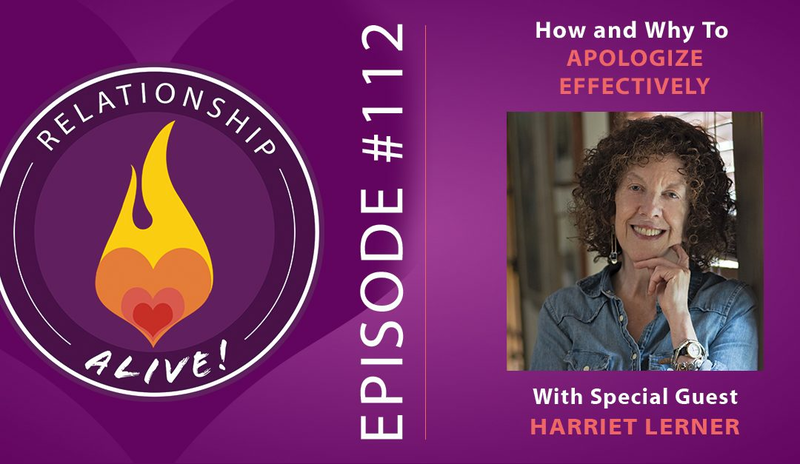 In today’s episode, we’re chatting with Dr. Harriet Lerner, author of the bestselling The Dance of Anger. Her new book, Why Won’t You Apologize? : Healing Big Betrayals and Everyday Hurts, is a direct, insightful guide on the art of the apology – with some surprising truths that can help you create healing when you need it most. 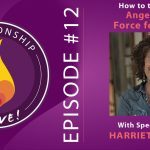 If you’re interested in checking out our first episode together, here is a link to Episode 12 – How to Turn Your Anger into a Force for Good with Harriet Lerner. It is never too late to apologize: The need to give and receive apologies is universal- we have hurt and will continue to unwillingly hurt others and be hurt by them. While we must all do all we can to treat those in our life with kindness, care, integrity, respect, and love, we will inevitably cause hurt. The goal then is to make a repair. It is never too late to apologize! It is appropriate to make an apology as soon as you become aware that you caused hurt- whether this is hours, days, weeks, or decades after the fact. “I’m sorry”: ‘I’m sorry’ are some of the most important words we can gift each other. These words become the gateway into repair and healing. When we give another person our full apologies we offer them safety, soothing, and evidence that we care about their feelings and are capable of and ready to take responsibility for what we have or have not said or done. Apologizing is a process that involves listening: Apologizing is much much more than offering the words ‘I am sorry’. While these words mark the beginning, it is a process that can sometimes feel like a long distance run. At the core of an honest and authentic apology is the ability to listen. We must be willing to sit with the hurt party’s anger and pain. We need to stay long enough to really grasp their injury, to validate their feelings, and to willingly offer to carry some of the pain that we may have caused. Be there until the hurt party trusts that you really get the wrongness, and that you are and will be reflecting on it. Invite more: If you were the one who inflicted harm, be sure that you do not use the “I’m sorry” to shut the other person down, create closure, and avoid pain. Commit to the apology as an unfolding and evolving process, and find ways to frequently follow back around after the initial conversation. Create spaces and times for the hurt party to share more by going out of your way to check in and ask about how they are feeling in relation to the injury, even without their prompting. This reaching out shows your commitment to inviting any more processing that may be needed. Gift to the Self: A true heartfelt apology is as much a gift to the other as it is to ourselves. Our level of self-worth rests on our ability to see ourselves objectively and to see our behaviors against others with clear eyes and assume unequivocal responsibility for acting at another person’s expense. As we offer our apology we are choosing maturity and integrity over self-protection, avoidance and fear. Shame: Apologies are near impossible from a place of shame. A person needs to have a solid platform of self worth to stand on in order to not collapse into self-loathing. With the higher vantage point offered by self-esteem, we are capable of looking at our bad behavior and harmful actions and seeing them as mistakes that are part of a large, complex, and ever changing picture of who we are as human beings. Calm down first: Authentic and effective apologies can only come from a regulated place. Be sure to take the time and the actions necessary to calm yourself down. Without tending to the dysregulation it is too easy to come from a defensive place in which you end up finding a way to make your “I’m sorry” include a hint of blaming, of vagueness, excuse making, and/or focus on the OTHER person’s ‘crime sheet’. So breathe, ground, center, and get clear with yourself that your motivation to apologize is coming from a place of good will and the genuine wish for a better relationship. Good, and better apologies: Remember that apologizing is not a way to speed up the repair process as much as it is a slowing down to create the time and space needed to take full inventory of the hurt and the responsibility. A real apology means that you are available, and will continue to make yourself available, by keeping your heart open, and giving the gift of deep listening. A true apology involves caring about the relationship and the other person more than you care about your own self-image and protection. It involves an acceptance of responsibility for your part of the problem and a commitment to ongoing awareness and action related to the hurt. 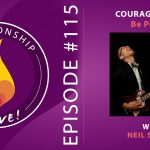 Get your BUT out of your apology: There are many ways we ineffectively apologize if we are not coming from a calm and caring place. We make excuses, we send mixed signals, we become passive aggressive… and most commonly we use the word ‘but’. ‘Buts’ have NO place in an apology! This signals a rationalization, an excuse, and a focus on the other person’s behaviors. While often our partner may have their own pieces to apologize for in an interaction, a true apology only focuses on our behaviors, and never on their feelings. For example, you might say “I’m sorry for correcting your stories in front of all of our friends at dinner”, vs. “I’m sorry you felt belittled but I was just trying clarify the details”. Take ownership of your part, find out how it impacted them, and begin to repair. 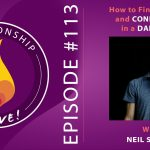 The art of asking for an apology: While we all long to hear “I’m sorry”, “I really get it” and “your feelings make total sense”, the difficult truth is that sometimes we have to wait a long time. Furthermore, there are certain apologies that we long for and deserve that we may never get. This does not mean we can’t ask for it. The best reason to bring up something painful that you really want someone to acknowledge is because you need and want to hear your own voice speaking the truth about what you really believe and what you know to be true. When and if you do speak up, keep it simple. Be direct, short, and say it with kindness instead of begging for their attention, or criticizing/blaming/shaming them into a sorry. The longer the word count the quicker they will vacate the premises! Share your truth and then invite them to consider your feelings and the effect their behavior had on the way you felt. Of course there will be longer conversations needed, but the initial confrontation will go better if you say it concisely. Accepting an apology: As much as there is an art to apologizing, there is also an art to receiving an apology. Initially it is best if you receive with grace and openness. Here too there is no place for the ‘BUT…’s. Simply thank the other for their apology, and save the discussion for a later time. Remember that acceptance is different than forgiveness- an apology can lead to both deep forgiveness and to letting go and both paths are worthy. The important piece is that together, and separately, but parties are working towards freedom. The myths of forgiveness: We live in a culture that is obsessed with forgiveness. There are many myths, including the misleading belief that you must forgive in order to move on and be whole. The truth is that there are many different pathways to finding peace. Forgiveness is not a universally healing emotion, especially not when it is forced or coerced. “You need to forgive” are the last words that a hurt party needs to hear and will inevitably leave them feeling alone, and betrayed all over again. It is no one else’s job to tell you that you have to forgive, or that you should. 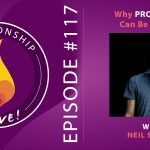 It is, however, your own responsibility to find ways to protect yourself from the pain you hold, the corrosive aspects of bitterness, and the hate that may be keeping you stuck. This may or may not require forgiveness, but it sure as hell does not require transcending the anger and pain. The hurt holds wisdom, information, and often a plan for what is needed going forward. 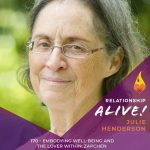 Listen in and get creative with your self care knowing that there are MANY ways to heal!